So it’s Year Zero +1 in the VR industry, and I thought it might be worth taking some time to assess where the industry is right now from what we (and Freddy) saw at CES last week. At the end of last month, Apple released iOS 11, along with their new range of devices. Among many other features iOS 11 includes ARKit, Apple’s new technology for augmented reality. This news flew under the radar for many people. It was the last thing listed on Apple’s press release about the next generation of devices, and was overshadowed by the controversy around the new iPhone X. In a way, this low-profile release of ARKit makes sense; AR has had a niche appeal since Google Glass failed to take off back in 2014, and it’s only been helped a little by the global success of Pokemon Go. Outside of a few gimmick-driven games, art installations, and tech demos, it’s unclear what value AR would bring to most people and it seems destined to vanish just like Glass, so it makes sense for Apple to regard AR as taking a risk, and not to bill it too high. But, despite AR’s pragmatic origins, most of the consequent uses of the tech have been for entertainment. There are some exceptions, such as Ikea’s catalogue app or AirMeasure, a nifty ruler app which lets you test the position of an object in a space, but in general these are just variations on the most basic application of AR: putting something virtual into a real space. Some companies including Microsoft have begun to popularise the broader concept of practical AR via devices such as the Hololens, but these products are currently pitched towards professionals such as industrial designers and surgeons. The military AR device was exceptional because it was accessible to a large group of people, had a practical use, and could be integrated with day-to-day operations, and at RealityLab: London we see these as good principles to help guide the coming wave of popular AR (e.g. in the form of ARKit and its Android doppelganger, ARCore) and as a major opportunity to assist with everyday work in many other fields. Image from Wikimedia Commons. License: CC share-alike by attribution. Imagine a taxi driver who wants to get to their next client as quickly as possible and not wanting to reconfigure their GPS for each call: with augmented reality, the road in front of the driver could be lit up, with colour-coded icons showing the route to each customer, their likely value, and any major delays or incidents which could affect the journey. A similar technology could be imagined for long-distance lorry drivers, but with the emphasis being on accessible roads, dynamic blind spot reminders and regular rest stops. Or imagine the impact AR could have on the effectiveness of emergency services: incidents could be triaged and staff directed in real-time, with information on the numbers and locations of staff readily available to a control centre, along with rolling video footage. And this isn't just a fantasy: companies like Garmin sell HUDs which already realise that vision, albeit in a simple form. Beyond navigation, AR also promises easier training of people in technical skills; you could overlay close-up footage of a carver’s technique as they carve, or have an explanation of each part of an assembly line available to new engineers. This could even be integrated with guidance systems to make sure that the right balance of skills is available on a given project at the right time. Image from MIT Tangible Media Group. License: CC Non-Commercial by Attribution. Research groups such as the MIT Media Lab’s Tangible Media group are even working on ways to augment senses beyond sight, through means as diverse as shape displays, shapeshifting noodles, and sensor-laden body suits - and headphone companies have recently introduced variable noise cancelling - allowing recorded noises to merge seamlessly with the real world, so in the future it’s possible that we might not only be able to see and hear virtual objects, but touch and manipulate them also. At RealityLab: London we think It’s only a matter of time before these technologies become an everyday part of organisations’ repertoires, and the emerging global AR platform and ecosphere, as offered by Apple's ARKit and Google's ARCore, will present an important first opportunityfor companies to embrace the emerging world of augmented reality in the workplace. To find out more about our VR, AR, 360 film and gamification work, say hello@realitylab.com. Header image by Pablo Trincado of piece by Yayoi Kusama. CC by Attribution. We are delighted to announce that Freddy Gangemi has joined RealityLab: London as Head of Design. Freddy brings over two decades of experience from within the design space, and has delivered award-winning design projects for a variety of public and private-sector clients around the world. Previously an Associate at the global consultancy Steer Davies Gleave, he specialises in designing interfaces between people and places – a precious skill for creating highly effective virtual and mixed reality experiences, and he has worked with world-class architectural firms including Foster + Partners, Maki and Associates, Weston Williamson and Partners, Shigeru Ban alongside many others. In Freddy's own words: "I am excited about the technology and its transformative potential within the design industry - and believe that VR and AR have the power to dramatically change not only the planning and design processes, but peoples' daily lives". Freddy's addition to our team will allow us to inject industry-leading insight into our VR and AR design across formats including Apple ARkit, Google's ARCore, Oculus Rift and HTC Vive, and, with his experience ranging as it does from from physical media to digital applications, we are looking forward to the exciting things that we will create together at RealityLab: London. It's been a busy period for us, as in the wider world of VR. We've been helping corporate clients including Vodafone, Marriott, Liberty Global and the Concerto Group to apply VR and 360 video content into their businesses. We partnered with Vodafone and Huawei to provide VR support for their APPEX Catalyst - an initiative that seeks new ways to combine technologies in order to enhance customer service. For Marriott International, we created an immersive VR experience to attract interest at their global events. We also worked with our sister company, Maverick, to provide 360 content for Liberty Global's Technology Summit in Amsterdam: an annual event where they preview a number of exciting new technologies. Finally, we worked with the Concerto Group to create a VR sales aid for a number of their most prestigious event spaces. We have also been active on the events front – running VR workshops, installations and participating in a variety of experiences across the medical, fashion and technology sectors, as well as providing 360 film content and support to some high profile game launches. Talk to us to find out more about what we have been up to - and how we can help your organisation to use VR and 360 film effectively. with many household names within their portfolio of companies. We worked together with our sister company, Maverick, to help Liberty Global create innovative 360 film of their Technology Summit. This brought together the various companies in their organisation with the aim of enhancing cooperation and knowledge-sharing across the spectrum. to enhance the online profile and audience engagement with the event and the brand. Contact us to find out how we can help your business use 360 video effectively. wanted to attract and engage. Working closely alongside Marriott, we designed and produced a VR game that fused motion tracking with amazing graphics to place the user into a virtual branded world with the challenge of hitting as many targets as possible to be in with a chance of getting on to the leaderboard. To find out more about how VR and gamification can enhance your publicity, contact us! process and delivery can be achieved both quickly and economically. the UK, but some only operate for a short period of the year. Their business challenge was that this time window meant that they were limited in ways to communicate these venues to potential clients for the rest of the year, with photos and videos only going some way to selling the unique atmosphere, geography and scale at the locations. March, or for a couple to book their ideal summer venue in the midst of winter. Ultimate Experience worked with Reality Lab on three different VR venue tours. Their expertise and skills have provided an invaluable sales tool for us. Reality Lab’s continuous support and flexibility throughout, and even after these projects were completed, has been incredibly helpful. As a team they have always gone above and beyond, and no question or queries have ever been too much for them. We can’t recommend them enough and look forward to working with them in the future. Contact us to find out how we can help your business use 360 film effectively. including Vodafone and Huawai as part of the APPEX technology project. combinations of technology within an omnichannel environment. 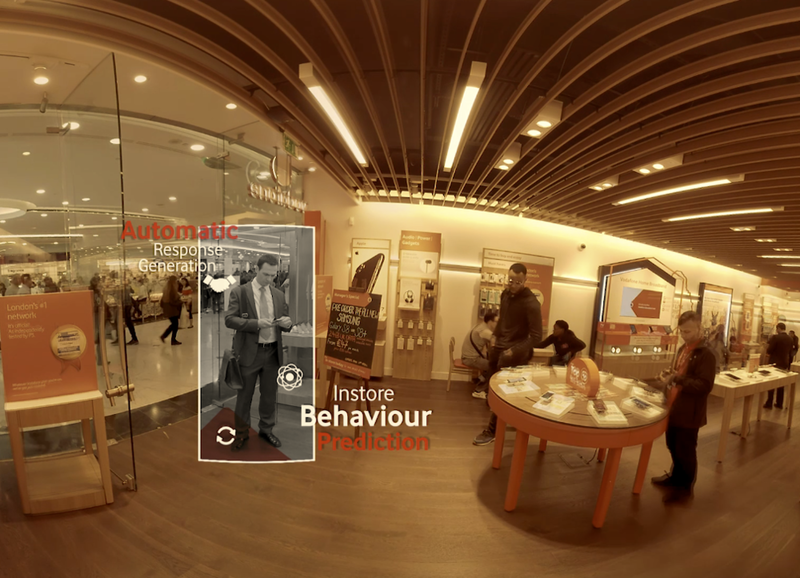 Our brief was to bring the project to life in 360 video content by explaining the vision and technology involved, and by connecting these to the enhancements to the Vodafone customer's experience. We worked closely with all parties to help simplify the complicated technological process into a more accessible format, and then filmed extensively with Vodafone to capture the elements from many different aspects of their operation across the country. We are proud to say that the project was awarded first prize at the TM Forum technology showcase, and look forward to the broader roll out of the technology we previewed in the film. Reality Lab helped the APPEX project team bring a unique and insightful edge to our presentation that our target audience could easily relate to and understand, in addition to being wowed through a virtual reality experience. The Reality Lab teams were engaged thoroughly and brought innovative, creative ideas with them to all parts of the process, allowing us to deliver the idea from initial thoughts into Virtual Reality, whilst always being assured under the challenging timelines. It was a pleasure to have worked with such a productive team. RealityLab: London are pleased to announce that Frank Davies has joined them in the role of Creative Technologist. Frank's previous role was running the emerging media space at Westminster University, and as a result he brings a wealth of practical experience in applying various technology into innovative uses, with project experience ranging across both hardware and software. A philosopher at heart, Frank sees many analogies between the worlds of programming and philosophy, and his zen-like attitude to technical and coding challenges is already being warmly appreciated. Nice to sit down with some of the great and the good in TV to discuss the potential of VR to work alongside broadcast media at the Mediatech 360 summit in London. The broad outlook was exceedingly positive, with lots of interesting thought on how the various media owners were looking to leverage the technology. All of us on the panel agreed that we had learnt a lot - hope the delegates did too. RLL were at E3 2017 to catch up with our friends in the games industry, and from our conversations it's safe to say that most games companies are very much in experimentation mode when it comes to VR. With the range of titles stretching from Doom VFR to The Inpatient to Moss there seemed to be a broad and exciting difference in how games companies were approaching the medium. This is a shot from one of the giant server rooms at one of the country's biggest communications providers. It was really interesting to see how the great and the good in the online fashion space were thinking about VR. In conversation with them it seems that many are considering it for in-store activation in the short term, but have the far bigger goal of using it as the logical extension of their virtual showrooms in the longer term: and, when you consider how much fun it might be for friends to try on various clothes in together in the virtual space, and how this would enhance the capacity for engagement and sales, you can understand why. We had the very great pleasure to demonstrate interactive and passive VR solutions at the recent Africa Health Summit 2017 summit @ Olympia. It was amazing to meet so many people who are passionately engaged in working to solve some of the most pressing health concerns in Africa: and we were struck how they responded to the potential of both passive and interactive VR as a potential tool to help them solve various communication problems. From charities wishing to communicate their work, to NGOs looking to influence decision-makers, to medical companies planning to train nurses to use specialist equipment in remote locations and even dentists looking to use VR to help overcome children's fears: the ideas came thick and fast. While not all of these ambitions will come to fruition, we were once again struck by how VR seems to both clarify and inspire it's potential amongst the most diverse of audiences when experienced 'hands on', and that's why we enjoy going on the road with VR so much. So thanks to all we met, and looking forward to picking up on some of the most interesting ideas with you soon.